Two new cards just joined the Shaman class. As we draw closer to the release of Hearthstone’s Rise of Shadows expansion, the card reveals keep coming. The latest cards to be revealed are Muckmorpher and Walking Fountain. Muckmorpher is a five mana cost four attack and four health Shaman minion with a powerful Battlecry. 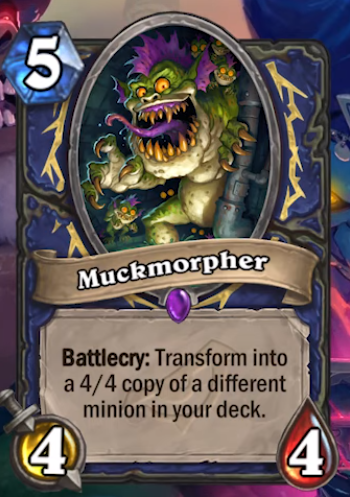 Muckmorpher’s Battlecry allows it to transform into a 4/4 copy of a different minion from your deck. This means the card has the potential to generate some serious value. Since the changes to Even Shaman, the class has struggled to find a place in the meta. It looks like Rise of Shadows aims to bring an interesting new playstyle to Shaman. Muckmorpher won’t be joining the class alone, either. Muckmorpher was revealed alongside fellow Shaman card Walking Fountain. This card is an eight-mana cost, four-attack, and eight-health minion with a plethora of keywords attached to it. Walking Fountain has Lifesteal, Rush, and Windfury. This means the turn you play Walking Fountain you can expect to generate some serious value. 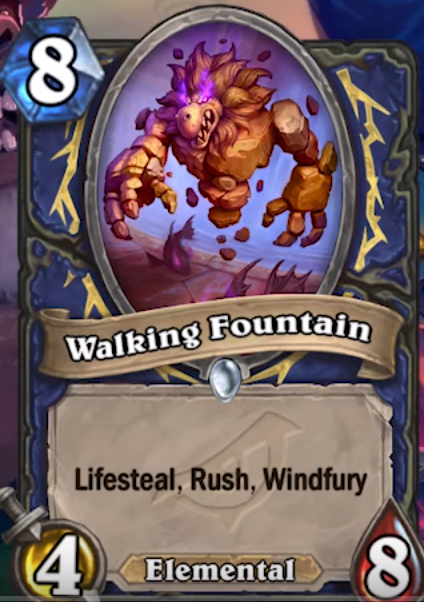 Though the mana cost for Walking Fountain is considerably high, the value it can potentially generate on its first turn in play might make it worth it. Four attack may not seem like much, but when you consider the card can attack twice and has Lifesteal, four attack isn’t too bad. Walking Fountain also has Rush, so the turn you play the card you’ll be able to heal yourself for eight health. Don’t waste all your excitement just yet, new cards will be revealed nearly every day leading up to the expansion. Hearthstone’s Rise of Shadows expansion becomes available for play on April 9.